Register for Baltimore ILG Virtual Event to Hear the Latest on OFCCP, EEOC, and the Use of Temp Workers in the Gig Economy! Listen to industry experts discuss OFCCP compliance regarding the use of contingent and temporary workers, and find out the latest happenings at EEOC and OFCCP. This virtual event is given by the Baltimore ILG and takes place on February 13 at 9:30 a.m. So grab a cup of coffee, tune in, and get the information you need to stay compliant in 2018! This Baltimore ILG virtual meeting is open to the public but please keep in mind seating is limited. Register today to reserve your seat. If you have further questions, please contact us at 800.882.8904. The Baltimore Industry Liaison Group (BILG) includes organizations from both public and private sectors. 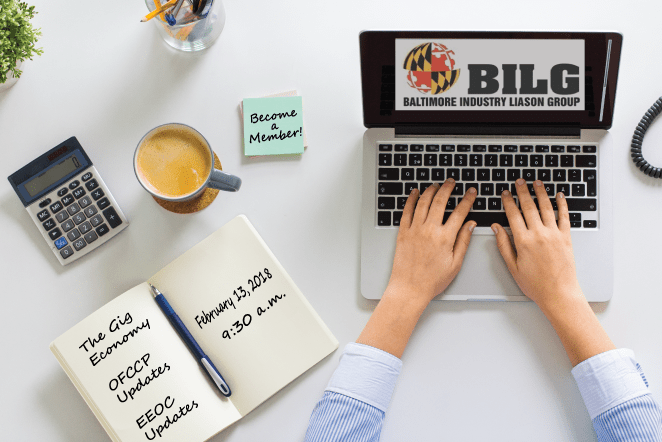 BILG provides a forum for information exchange and continuing education in the areas of affirmative compliance, equal employment opportunity regulations, updates from the Department of Labor/Office of Federal Contract Compliance and, in recent years, workforce diversity. Meetings are held quarterly and are comprised of seminars, education sessions (most with PHR/SPHR continuing education credits), roundtable discussion, updates and networking opportunities.The mission of the BILG is to act as a networking vehicle and sounding board between and among participating companies relative to Federal, State and Local statues and regulations/relationships impacting Affirmative Action and EEO compliance posture of business operations. To join Baltimore ILG click here to complete a member application, or to learn more email BILGMembership@gmail.com.